One week ago, we brought you the contentious tale of two games called Lugaru that Apple was selling on its Mac store. Today there is only one game called Lugaru in that shop. 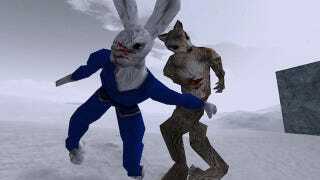 The game's original creators at Wolfire Games had been frustrated that Apple had not spotted what they deemed to be a copycat game, a competing version of their rabbit beat-em-up adventure called Lugaru. Theirs was $10. The other was sold for $2 by a group called iCoder. The iCoder version of the game didn't just use the open-source Lugaru source code but the game's characters, graphics... everything. Wolfire had assumed, incorrectly apparently, that Apple would sniff out copied games and raise a red flag, if not block the duplicate game altogether. What changed in a week? Apple doesn't appear to be the party that took the decisive action here. The people making the other Lugaru did. "The application was removed from sale by the development team, it was not pulled by Apple," Alex Matlin of iCoder told Kotaku today. Last week, Matlin had told us that he believed "that we have every legal right to market and sell the software." That right is no longer being exercised via the sale of a $2 Lugaru. Last week, an Apple spokesperson told Kotaku that the company was looking into the matter. Apple has not replied to a follow-up request about what actions it took, and Matlin did not explain why iCoder decided to remove the game a week after claiming its rights. The folks at Wolfire speculated today to Kotaku that Apple asked iCoder to remove the game, but said they'd only heard from Apple this week. The communication they received from Apple simply confirmed that the tech giant had received Wolfire's complaint about the second Lugaru. The brief life of $2 "counterfeit" Lugaru is over. The $10 original, sold by its creators, continues.